The Australian half of a couple married in Massachusetts is being deported, despite the fact that the Obama administration has stopped defending the Defense of Marriage Act and has urged discretion on deportations. Anthony John Makk, who is the primary caretaker for a partner with AIDS, applied for permanent residency as a spouse of an American citizen, but was denied because the Defense of Marriage Act explicitly limits federal benefits to marriage between a man and a woman. Not only has Attorney General Eric Holder said that DOMA is unconstitutional, the director of Immigration and Customs Enforcement said in June that agents should prioritize cases for deportation that concern "national security, border security, public safety and the integrity of the immigration system." 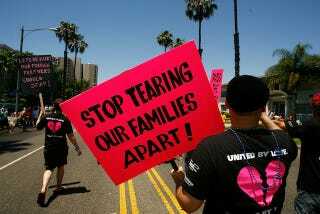 A spokesman for Immigration Equality says no exceptions have been made so far for gay couples.